Fernando Gallego (C. 1440 - 1507) was a Spanish painter, representative of the Hispano-Flemish school. It is believed that he was born in Salamanca, Spain. Was a close contemporary Dutch painters, especially Diriku Boots. One of the first realists in painting Spain. Creative activity is most active between 1466 and 1507. Wrote altarpieces for the cities of Zamora, Toro, Salamanca, Ciudad Rodrigo. The last time he was named in the document, in 1507, but the date of his death is unknown. OK. 1440, Salamanca or Zamora — after 1507, Salamanca. Spanish painter, representative of the Hispano-Flemish school. Perhaps he studied in the Netherlands have by Petrus Christus, was influenced by Dirk Bouts. Wrote altarpieces for the cities of Zamora, Toro, Salamanca, Ciudad Rodrigo, the Cathedral of which 25 are in the cook collection in Richmond. Creative activity is most active between 1466 and 1507. Unique in Spanish painting of the XV century attributed to Gallego painted vault in the University library in Salamanca (1479-1483 or 1500) with a challenging academic program that includes images of the celestial spheres, zodiac signs, stars, chariots of the gods, the Sun and the planet mercury. 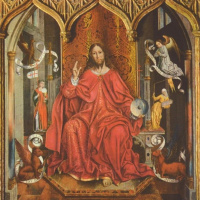 In his paintings for the altars (1507, Salamanca, New Cathedral; Zamora, Cathedral, altar, begun in 1467, are now fragmented) influence of Dutch paintings and German engravings of the acquired, as the majority of compatriots Gallego, artists Hispano-Flemish school, archaizing character. He is a master of tough and sharp tending to the image of dramatic situations. In an effort to make their work the note of spiritual tension, the artist resorted to large-scale discrepancy of figures, sometimes their sharp angles and exaggerated facial expressions. The lamentation of Christ (Madrid, Prado), painted in the Dutch tradition of landscape with high horizon, filled with lots of detail, excessively small portrait is marked to the validity of the figures of the donors, conventionally, the combination of spatial plans, action is constrained. However, the art of Gallego, which lies like a frozen strength, has a simple grandeur. These are his painting in the New Cathedral in Salamanca, especially the image of St Christopher on the left side of the altar, the painting of the Pantokrator (CA. 1485, Madrid, Prado) executed in guisasola tradition, in a sophisticated palette of cool colors, the lively spots of dark tones. Fernando Gallego paintings are often attributed to his son or younger brother, Francisco Gallego, where it is always quite restrained Fernando used methods of external expression acquire close to the grotesque character.